This video series shows you a simple, yet extremely effective technique for handling, and eventually completely transforming your relationship with, STRESS! In this last video of this series, I get into step 3, and show you how and why to pay attention to the transient nature of the sensations, thoughts and emotional states you associate with stress. I also explain some of the more subtle aspects of the non-reactive observation from the previous video (Part 2) and how to work with them. 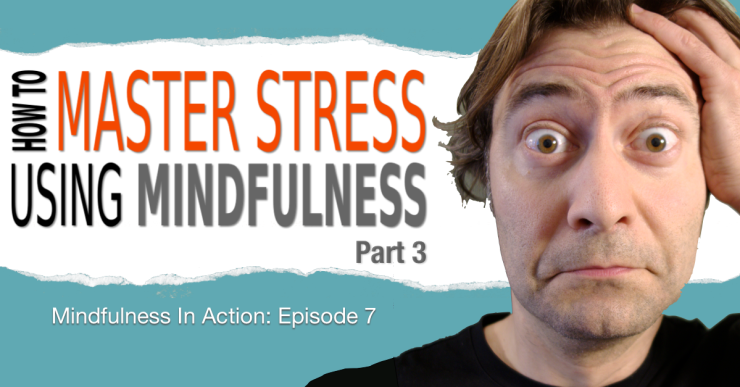 Thanks for joining me for the third and final part of this series where I show you how to use mindfulness to transform your relationship with stress, using what I call the Stress Surfing technique. If you haven’t watched part 1 and 2 yet, you’ll want to do that first before watching the rest of this video. At this point, you’ve had some practice identifying the physical sensations, thoughts and other mental activity that tell you that you’re feeling stressed. And you’ve tried just observing these sensations, with acceptance and curiosity, without reacting to them or trying to change them in any way. Now I want to show you the third step in the Stress Surfing technique, seeing the transient nature of these experiences. But before I get into how you do it, I want to explain why this is helpful. Tolerating, and actually being open to and accepting intensely uncomfortable sensations is hard. It can be psychologically exhausting. Especially when you’re new to this. The reason is that you’re restraining your habitual tendency to avoid or act out these sensations. That takes a lot of willpower and discipline, which you only have a finite supply of. Eventually, you’ll exhaust your supply of it. This kind of mindful, non-reactive observation is actually pretty subtle. In fact, you’ll know you’re doing it right when it stops feeling like an act of will. When allowing all these uncomfortable sensations to be present feels natural, like it’s no big deal. But getting there is a process, so don’t beat yourself up if you don’t experience it this way at first. The most direct route to this kind of effortless mindfulness of the unpleasant is to notice a very special and actually quite profound quality that all sensations, thoughts, emotional states and so on possess. This is the quality of impermanence. No matter how awful or uncomfortable the sensation, it doesn’t actually last for very long. And seeing this for yourself can be a tremendous relief. You may think you know this, on an intellectual level, but it’s another thing entirely to experience it in the moment! When you’re in the middle of a storm of stressful feelings, a hair’s breadth from freaking out, I bet the stress feels like it’s going to last forever, unless you do something quick to make it go away. And that’s the whole problem. That’s the reason we avoid, suppress, make excuses, blame others, and engage in all the other unskillful reactions to stress. To make these unpleasant feelings go away. But, if you do the opposite, if you just allow the uncomfortableness to be present and don’t act on it, these sensations go away all on their own, and usually quite quickly, so there’s actually no need to do anything with them! This is the magic of impermanence. If you can remember that the twisting, nauseous feeling in your gut is only going last for a few seconds if you just allow it to be, that’s hugely motivating! That makes it so much easier to accept and be curious about these sensations. Of course, these sensations will most likely come back, again and again, until you address the underlying cause of the stress. That’s to be expected. Just keep applying the Stress Surfing technique as often as you need to to stay cool and figure out what your next step is. But this only works if you honest to goodness don’t resist or try to get rid of the unpleasant sensations that are associated with the stress. As you practice this stuff, you’ll probably get to a point where you’re sure that you aren’t pushing this stuff away, you feel that you’re letting it all in, accepting it, but the stress just keeps building in intensity and seems like it has no intention of showing you it’s transient nature! This is when you need to go a little deeper to discover the more subtle forms of resistance you may have to the stress. The first place to look is your body. See if you’re holding any tension in your body. If you are, that tension is usually a good indicator that you’re still resisting the stress to some degree. If you notice this kind of tension, allow it to relax if you can and open up to more fully accepting all the sensations associated with the stress. See if you can treat them the same way you would treat a totally neutral sensation, such as say, the feeling of pressure on your hand when you turn a door knob or something like that. The more you mindfully observe the transient nature of these sensations, the less of a big deal they become and the easier it will be for you to remember this the next time you find yourself in a stressful situation. If you keep doing this consistently, your relationship with stress will begin to transform. The stress will change from something you identify with: “my stress”, or “I am stressed” to a bunch of sensations, thoughts and other mental activity that you can observe: “stress is present”. You’ll be able to keep more of a cool head. The sensations and mental activity associated with the stress will become useful information for making good decisions, rather than triggers for habitual, unskillful actions. In other words, you’ll be Stress Surfing! Now, I realize that what I’m asking you to do won’t always be easy. It’ll take practice. Just like with actually learning to surf ocean waves, you should expect to fall down a lot while you’re learning. That’s totally normal and nothing to beat yourself up about. Try to take the perspective that you need to fall at least 100 times before you can stand up on your board and stay on long enough to surf your stress. Each time you fall, you’re getting closer to that goal. And if you’re serious about this and you want to really turbo charge your ability to go Stress Surfing, then the best thing you can do is to set aside some time to meditate each day. Even 15 minutes of daily mindfulness meditation will really help you learn to accept and be curious about the physical sensations, thoughts and so on that you’ll encounter while in a stressful situation. Think of it like going on training runs so that you can eventually do that marathon. Each run gets you in better and better shape. Meditation works the same way. It lets you practice mindful observation on easier things and allows you to very efficiently develop enough skill so you can apply it to situations like I’ve been talking about here. So, that pretty much wraps up this video and this series. What I want you to do is prove to yourself that the sensations associated with stress really are impermanent. And to do this, I want you to time how long they last when you don’t do anything to mess with them. 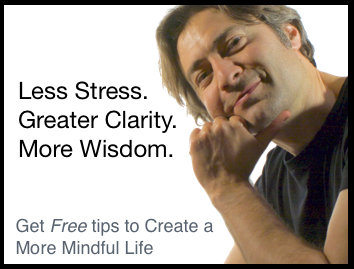 The next time you recognize that you’re stressed, do what I’ve shown you in these three videos and mindfully observe the physical sensations associated with the stress. Pick the sensation you find easiest to notice and use your watch to time how long it lasts when you observe it non-reactively. I bet you’ll be surprised by what you find! Go ahead and share what you discover by posting a comment below this video. Also, if you know someone who could use some de-stressing in their life, send them an email with a link to this video and pass it along. It could really help them out. I’m Nick Grabovac. Thanks for watching. Hi! I am loving these videos. I have been doing the first two steps to deal with physical pain and didn’t know it was mindfulness until I learned what mindfulness was and then as I saw these videos I thought wow I’ve been doing that! I use the first two steps to deal with pain that I have to deal with like pain in my legs when I walk and know that I can’t get rid of it and know that I have to walk. And the cool thing is the pain stays but I don’t feel uncomfortable any more and I don’t say ouch every time I take a step–the feeling is just there. I will definitely use the third step from now on and see how much of an improvement it will bring.